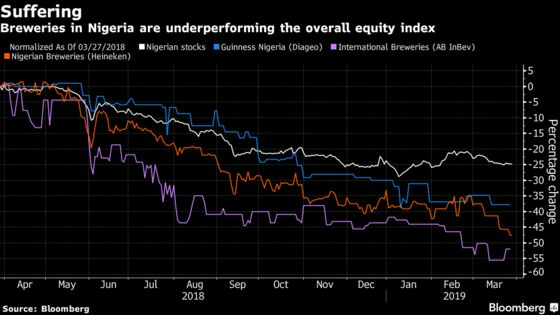 (Bloomberg) -- For brewing giants AB InBev SA, Heineken BV and Diageo Plc competing for market share in Africa’s most populous country, the Nigerian government’s decision to hike excise duties is another setback in an under-performing economy. President Muhammadu Buhari’s administration followed up its June decision to impose taxes on beer and spirits by deciding in January to implement another phased 17 percent increase in duties on alcoholic beverages. The move, a bid in part to counter flagging revenue from the key oil industry, is making the business environment more difficult for the drink giants in an economy that contracted in 2016 and has faced double-digit inflation since then. The government raised the taxes and increase borrowing on local and international markets after failing to meet its revenue targets in the past three years, primarily due to lower-than-expected oil exports -- its main source of income. Budget and Planning Minister Udo Udoma put the state’s receipts at about 55 percent of expected earnings last year. The levies have hit demand. The numbers were already bad last year. Heineken’s local unit, Nigerian Breweries Plc, reported 2018 net income that fell 41 percent from the previous year to 19.4 billion naira ($54 million) due to “increased excise duty rates” as well as “a challenging operating environment,” Chief Executive Officer Jordi Bel said during an investment call in February. The company partially backed down from price increases it attempted in June in response to higher taxes. Sales still declined 5.9 percent in 2018. This year could even be more challenging, Bel said. International Breweries Plc, the local unit of AB InBev, declared a loss of 7 billion naira for the nine months through September, citing rising costs that included taxes. Diageo-owned Guinness Nigeria Plc saw its growth blunted by the higher levies, Baker Magunda, chief executive officer, said during an investment call in January. The companies didn’t answer calls seeking comment. The companies’ share prices have taken a hit. Nigerian Breweries stock retreated 9.7 percent to 56.90 naira, the lowest since March 2010, by 1:20 p.m. in Lagos, making it the worst performer on the 164-member Nigerian Stock Exchange All Share Index. The stock has fallen 33 percent this year, compared with 3 percent drop by the benchmark index. Guinness has retreated 13, percent while International Breweries has declined 15 percent. The brewers’ difficulties are forcing the government to have a rethink of the taxes, Paul Abechi, a spokesman for Finance Minister Zainab Ahmed, said in emailed response to questions, without giving a time frame. The administration is looking to address the tax grievances “in a mutually benefiting way,’’ he said. While the brewers wait and see limited opportunities for growth in sales of lager, they’re pushing premium brands shielded from higher costs, as well as the non-alcoholic drinks exempted from excise charges. “With the operating terrain still challenging, we believe brewers will be cautious on price increases as they look to defend their market share,” Vetiva’s Olowoporoku said. Guinness plans to increase its share of income from spirits, and Nigerian Breweries is focusing on its premium Heineken, stout and malt drinks for growth. Brewers in Nigeria are confronted by “a combination of slow volume growth, a flat beer-pricing environment, intense competition, higher raw material costs and higher excise, culminating in declining cash margins,” according to Adedayo Ayeni, an analyst at Renaissance Capital in Lagos.